Obama decrees Americans can keep their health plans -- but can the damage be undone? Stung by public anger and his rapidly plunging approval ratings, President Obama wants to delay the cancellation of existing health care insurance policies for one year. It has nothing to do with the public interest. It has everything to do with crass political calculations. As an electoral tsunami gradually develops that threatens to drown Democrats and give Republicans a healthy majority in the Senate, Democrats remain focused. They are clinging to the increasingly unlikely prospect of recapturing the House of Representatives in next year's elections, a move that would allow them to ram through more America-killing legislation. This, of course, assumes the Democrats keep control of the Senate, something that at the moment seems quite impossible. President Obama yesterday played out a tableau that could easily have come from Hans Christian Andersen's "The Emperor's New Clothes." Obama preyed on the most gullible Americans, the lowest of low-information voters, putting on a show for their benefit. But even Americans who can't name the Vice President of the United States know something about Obamacare, so they are not likely to be easily manipulated. Obama might have gotten away with such a dimwit-friendly tack but for the fact that everyone in the country knows Obama lied about Obamacare allowing Americans to keep their health plans and their medical doctors. In addition, too many people are experiencing real hardship as the Affordable Care Act causes their insurance to be canceled -- and they know who to blame for their pain and suffering. In the James S. Brady Press Briefing Room of the White House, the president and press corps may as well have been surrounded by unicorns, leprechauns, and satyrs as Obama threw pixie dust in the air and waved his magic wand after mispronouncing incantations in Austrian. Obama exposed the residents of all 57 states of the nation to his lies yet again, promising that even now Americans would be able to keep their health insurance plans if they liked them. "I completely get how upsetting this can be for a lot of Americans, particularly after assurances they heard from me that if they had a plan that they liked, they could keep it," Obama said in his by-now tiresome fake sympathy routine. "And to those Americans, I hear you loud and clear. I said that I would do everything we can to fix this problem. And today I'm offering an idea that will help do it." Obama explained that a grandfather clause in the Affordable Care Act already allows people whose insurance plans don't change to keep their plans. He didn't bother to explain that that consumer protection measure is more or less moot because insurance plans change constantly. "Today, we're going to extend that principle both to people whose plans have changed since the law took effect, and to people who bought plans since the law took effect," Obama said. Except that His Imperial Majesty is doing no such thing. While taking credit on live television for appearing to do something about the cancelation crisis caused by the Obamacare law, Obama passed the buck to insurers and state regulators. The president said state insurance commissioners retain authority to decide which plans can be sold in their states and insurance companies "can extend current plans that would otherwise be canceled into 2014, and Americans whose plans have been canceled can choose to re-enroll in the same kind of plan." Except that they can't. The Obamacare statute says they can't and the economics of the situation won't allow it. The legal infrastructure of the health care insurance market has been changed. Policies were canceled because they don't subsidize all the new services that Obamacare mandates. Those policies no longer exist for a reason. Insurers can't just push a button and bring them back into existence. Obama's bizarre pronouncement reflects leftists' disdain and ignorance of market processes, and the president's determination to proceed in defiance of those processes. A locomotive going 60 miles per hour can't stop instantly when brakes are activated. Similarly, the Obamacare juggernaut has so many moving parts spread out over such a wide area that locking up one part of the beast won't stop it from continuing to barrel forward. "We’re also requiring insurers to extend current plans to inform their customers about two things. One, that protections -- what protections these renewed plans don’t include. And number two, that the marketplace offers new options with better coverage and tax credits that might help you bring down the cost." It's pure fantasy, of course, but lying, stalling, misdirecting, and stonewalling have served the Obama administration well over its first five years. Besides, extravagant healthcare subsidies begin to kick in next year, and all that free money floating around is bound to calm at least some irate consumers. When consumers find out they've been hoodwinked, the Left is counting on them to blame the corporate world. Obama and desperate Democratic lawmakers are already blaming insurance companies for en masse cancelations, and saying insurers should let consumers keep their plans, seemingly oblivious to the fact that all this upheaval was caused by the Obamacare law. Obama's fanciful fix requires cooperation from insurance companies and state regulators, and so far he's not getting it from either. Health care insurers promptly slapped down Obama's proposal and refused to accept the blame. "The only reason consumers are getting notices about their current coverage changing is because the ACA requires all policies to cover a broad range of benefits that go beyond what many people choose to purchase today," said Karen Ignagni, CEO of America's Health Insurance Plans (AHIP). "Changing the rules after health plans have already met the requirements of the law could destabilize the market and result in higher premiums for consumers. Premiums have already been set for next year based on an assumption of when consumers will be transitioning to the new marketplace. If now fewer younger and healthier people choose to purchase coverage in the exchange, premiums will increase and there will be fewer choices for consumers. Additional steps must be taken to stabilize the marketplace and mitigate the adverse impact on consumers." State insurance regulators also threw cold water on the crazy proposal. Washington State Insurance Commissioner Mike Kreidler, a Democrat, said allowing state residents to keep their non-ACA-compliant policies would wreck his state's health insurance exchange so the state won't permit it. District of Columbia Insurance Commissioner William P. White, who was appointed by the city's Democratic mayor Vincent Gray, said the proposal "undercuts the purpose of the exchanges, including the District's D.C. Health Link, by creating exceptions that make it more difficult for them to operate." All of this chaos created by Obamacare and President Obama's admission that his system isn't working, vindicates the aggressive approach taken by conservatives who pushed hard to defund Obamacare before the partial shutdown of the federal government last month. The Senate Conservatives Fund, which has been at the forefront of the fight, loosed a mass email after Obama's speech yesterday, boasting that, "Ted Cruz was right. Republicans should have refused to fund Obamacare." "The president's health care law is an unmitigated disaster and now Democrats in Washington are running for political cover. If Republicans had listened to Mike Lee (R-UT) and Ted Cruz (R-TX), they could have won this fight and stopped Obamacare. Instead, Mitch McConnell (R-KY) sabotaged the effort and now Americans are paying the price." The SCF points out that Congress will have another opportunity to defund Obamacare two months from now. "Obamacare funding expires January 15 and Republicans should not renew it," the political committee says in the email. "If Democrats cause another government shutdown to protect this terrible law, Republicans should hold firm and use the showdown to push for full repeal." Although the House is expected today to take up Congressman Fred Upton's (R-Mich.) largely symbolic legislation that would supposedly allow Americans to keep their insurance plans, Speaker John Boehner (R-Ohio) urged repeal. "There is no way to fix this," he said following Obama's presser. Even Sen. John McCain (R-Ariz.) is now calling for the repeal of Obamacare. Just weeks ago McCain labeled those fighting Obamacare as "wacko birds." It should be noted that Obama's midday press conference yesterday, which started more than a half hour late, came the day after the the administration's latest lies about enrollment numbers were made public. Leftist Greg Sargent of the Washington Post, ever the patient Obamacare cheerleader, eagerly conveyed the administration's lies, claiming "[a]round 106,000 enrolled in new plans during October." He linked to a grossly misleading flow chart at the U.S. Department of Health and Human Services that tries to justify the make-believe enrollment figure. The chart states with lawyerly precision that "106,185 have selected a Marketplace plan," and that "396,291 Americans were determined or assessed eligible for Medicaid/CHIP." 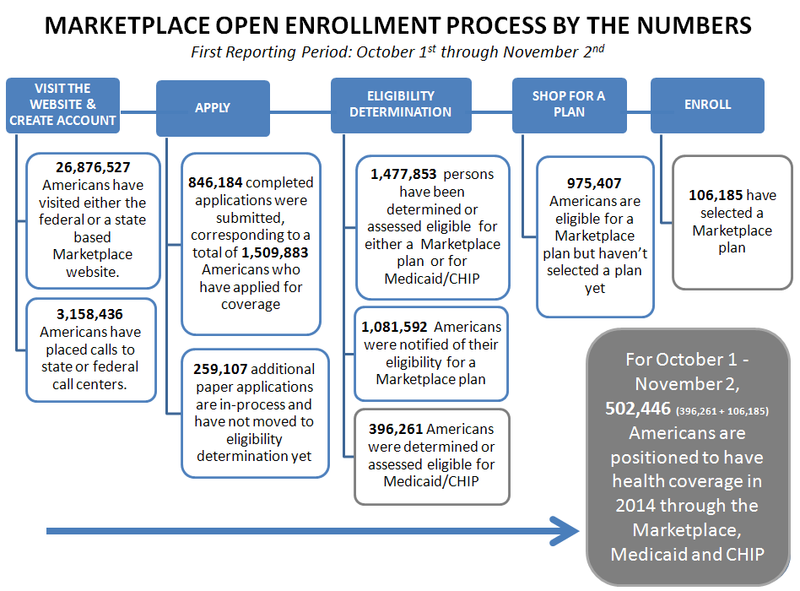 Therefore, the chart concludes, "For October 1-November 2, 502,446 (396,261 + 106,185) Americans are positioned to have health coverage in 2014 through the Marketplace, Medicaid and CHIP." The 502,446 figure is interesting but irrelevant. The indispensable Avik Roy of Forbes says the real enrollment figure (as of Nov. 8) was a pathetic 45,865 spread out over 19 states. That represents a laughable 0.7 percent --that's seven-tenths of one percent-- of the total first year enrollment goal of 7 million by March 15, 2014. There have been about 5 million cancellations nationwide, according to Roy. Visiting healthcare.gov or a state exchange website, creating an an online account, applying for coverage, and choosing a government-approved exchange plan, doesn't count as an enrollment, Roy reminds us. An insured person has to pay the initial premium to have coverage begin and for the action to count as an enrollment. Unless the government meets its enrollment goal, tricking young, healthy persons into agreeing to heavily subsidize older, sicker persons, the Affordable Care Act cannot succeed, Roy writes. "Low exchange enrollment results in higher premiums for those who do enroll, as the costs of coverage and care are spread out among premium-paying enrollees." With all this news of Obamacare-created chaos descending on the nation, now is not the time to be cutting deals with pitiable Democrats. Although Obamacare may already contain within itself the seeds of its eventual self-destruction, Americans who care about the future of this country have to keep the pressure on. We can't assume this hideous program will go away on its own. Conservatives have to keep pointing out that the Emperor has no clothes until they are blue in the face and ready to drop from exhaustion. Now is the time to go on offense. To watch this week’s episode of The Glazov Gang, which focuses on When Obama Said He’s “Sorry” and unravels the president’s peculiar apology about his ObamaCare lie, Click Here.